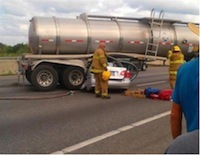 Alhambra Truck Accident Injury Attorney - Over 40 Years of Experience You Can Trust! Were You or Anyone You Know Injured in a Truck or Car Accident in Alhambra? Our Alhambra truck and auto accident injury lawyers and law office provide aggressive and compassionate legal representation for the injured victims of truck accidents, including victims of crashes with heated asphalt trailer trucks or fuel trailer trucks, and for the families of the victims killed in fatal collisions or for wrongful death claims in the city of Alhambra that is in the western San Gabriel Valley of Los Angeles County, California. Alhambra is inhabited by 83,089 people and is bordered by Monterey Park to the south, Rosemead to the east, Pasadena to the north and Los Angeles to the west. 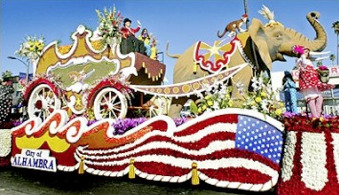 Alhambra is known for holding the Chinese Lunar New Year Festival and Parade. There have been several notable people who live or have lived in Alhambra that include Dorothy Howell Rodham, mother of Hillary Rodham Clinton, and the infamous Phil Spector, who was convicted of second-degree murder of Lana Clarkson, an actress that lived in Spector's Alhambra home. There are many occasions that an accident takes place because a driver cannot see if another automobile is in the adjacent lanes and the mirrors do not show anyone nearby. Regardless of the vehicle and its size, there are blind spots that prevent a driver from knowing if another vehicle is passing by the right or left side and this makes it necessary for drivers to not only check their mirrors but also make at least one look out of their vehicle to be certain that no one is coming before changing lanes or making a turn somewhere. Truck drivers, especially company vehicles that have trailers connected, have significantly larger blind spots that makes looking out of the window not just precautionary but a requirement for any time the truck driver wants to change directions on the road. Truck drivers usually have a larger blind spot on their right side, so it is recommended for other drivers to pass by the left side of a truck. Consistently checking the blind spots of your vehicle before turning or lane changing could substantially reduce your risk of getting into an accident and sustaining severe injuries. A knee cap or patellar fracture is a form of injury that auto accidents can cause. Usually there is pain and swelling in the front of the knee followed by symptoms including bruising, the inability to straighten the knee and the inability to walk. If parts of the bone are not displaced, then surgery might not be required but otherwise, the victim will need surgery. Surgery, depending on the way the bone was injured, would involve using tension bands or wires and screws to keep the bones in place and some bones might be removed altogether if they are too small to fix back into place. Please contact us now, including for referrals to doctors who may provide treatment without a request for payment until the claim is resolved, if you or a loved one sustained a elbow fracture injury from any truck collision or other personal injury accident in Alhambra, Los Angeles or anywhere in California. The Law Offices of Gary K. Walch, A Law Corp., provides you with the strong advocacy that you need, along with understanding and compassion, when you or a loved one has gone through a devastating truck collision or other injury accident in Alhambra or anywhere in California. It is our duty to aggressively pursue your rights and best represent your interests. Our lawyers handle accidents involving truck, train, bus, motorcycle, bicycle, car, uninsured motorist (UM), hit and run, pedestrian and much more.